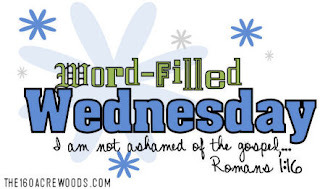 It's Word Filled Wednesday's again! 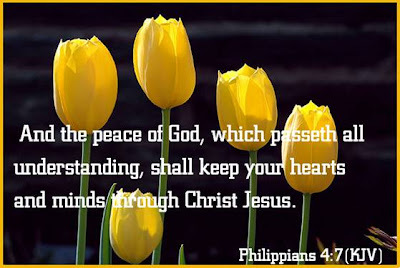 Today I would like to focus on the amazing peace and quietness that our soul can be filled with by trusting fully on God! I'm sure I'm not alone in this but often times we can get comfortable in our faith. We can be so comfortable in our faith that we can say we trust God and even trust Him completely even through a trial... until a trial comes that is and we REALLY have to trust Him! Well that's where I have been the past week. There has been trial after trial and not just tiny ones like losing car keys or spilled milk! But God has been amazingly faithful in putting certain individuals around me to remind me that He is in control and that my actions speak louder than words. I learned that through my actions last week, which I can now admit were NOT God honoring, were a result of not trusting in God. By not trusting in the Lord what I was really saying, God is not a good God, He doesn't love me, and He's not a merciful enough or powerful enough God to give me the grace to get through this. As you can see my pastor's wife did not sugar coat things when she was counseling me on this. Thank you so much for being straight forward Janet! So once she got this into my thick skull, I realized how prideful and sinful I was being and repented. As I was seated in court Monday (sorry, I shouldn't discuss details) I could honestly believe and live Phil 4:7. Thank you Jesus! It was just one of the greatest feelings in the world to sit there and honestly and truly be at peace with whatever the judge through our way. The hardest part was knowing our innocence and knowing that even with that truth she may not let things fall in our favor despite our innocence. Trusting God was crucial through this and knowing that whatever the judge's decision was was what God was allowing and would use it. The peace in my heart that I felt was like receiving a BIG HUG from the Lord himself. I feel like my trust in Him was good but now it's more than I could ever have imagined. I pray that everyone can and will know this kind of peace, it's amazing! Go visit 160 Acre Woods for more inspiring photos and verses. What a beautiful, honest post! In Prov. 21:1 it says that the heart of the king is in the Lord's hands and He directs it wherever He pleases. So you can rest safe knowing that the judge's heart is in God's hands too, and He will direct whatever decision the judge makes, and it will be for your good and your growth and His glory as you submit to His leading. I also love Prov. 24:10 "If you falter in times of trouble, how small is your strength." because I know that many times I have trusted in my own strength, and not in His, and I have faltered. Thank for, again, for blessing us today with your honesty. So thankful you have His peace through this trial, and I appreciate your honesty about the difficulty in it. I could really relate. "But God has been amazingly faithful in putting certain individuals around me to remind me that He is in control and that my actions speak louder than words." Me too. God is so good. AMEN! I have been praying this verse over friends and family! Yes, God's peace in the midst of the storm is such an immense blessing. It was the theme of my WFW this week also. We serve an awesome powerful God who tenderly cares for us and will be there with us in the depths as well as the heights. "Yea, though I walk through the valley of the shadow of death I will fear no evil. Your rod and your staff, they comfort me." I love tulips. Hope for Spring and new life. Thanks for sharing. Oh I loved your post and your words today! It's so humbling to run smack into instances where we MUST trust God... and boy have we all had our share of turns lately. Blessings to you!! I love your honesty through this post. God has blessed me through you today. Beautiful photo and verse, too. Praying God's best for you. Happy WFW! This is beautiful! And no,I seriously don't think you're the only person who takes their relationship with Christ for granted...trust me I know some real knuckle-heads...and I'm the QUEEN of them! HA!!! Bless you for sharing! I'll be praying for you! Your honesty is precious! Thank you for this beautiful verse...I love your blog,too! I really like your "Jesus is the Way" illustration on your sidebar. I have not seen one like that! Such a lovely post, be blessed. that is a great reminder for me this past week. thank-you. I love your open and honest post! Such an encouragement that we can find peace in God even in the midst of trials. Beautiful verse and photo. Glad you experienced God's peace amidst your trials this week. May we all learn to trust Him more. About my post, you are so right. The world wants us to believe that we cannot make it without our "me time. But seems to me that if we say that, then we are saying that God isn't enough for us. Thanks for the site, it sounds cool. and again I say, PRAISE THE LORD!